An inaugural conference on Greek Canadian Studies will take place at York University and will feature academics, writers and a film producer who will share their perspectives on Greek Canada. The York University Hellenic Heritage Foundation Chair in Modern Greek History and Hellenic Studies and the Greek Canadian History Project will host the Greek Canadian Studies Conference, which includes an evening event on May 3 and full-day conference on May 4. The conference opens May 3 at 6pm at the historic Papermill Theatre at Todmorden Mills (67 Pottery Rd., Toronto), and coincides with the Hellenic Heritage Foundation Wine and Cheese Social event. The event marks the launch of the Hellenic Heritage Foundation (HHF) Public Lecture Series with special guest Professor Thomas W. Gallant, holder of the Nicholas Family Endowed Chair in Modern Greek History at the University of California, San Diego and inaugural HHF Chair in Modern Greek History at York University (2002-2007), who will speak about the 1918 anti-Greek riots in Toronto and kick off the York University Greek-Canadian Studies Conference. 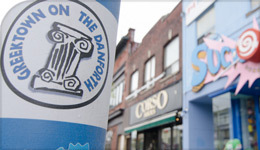 The daytime conference on May 6 presents speakers in four segments: Greek Canadians in Film and Literature (from 9:30 to 11:15am); Immigration, Language, History. The Immigrec Project (from 11:30am to 12:30pm); and Greek Immigration in 1950s-1970s Montreal: A Plural Approach (from 1 to 2:45pm); and Greek Canadians: Identities, Press, Education (from 3 to 4:45pm). The day will also feature a presentation onthe research project “Immigrec” on the history of Greek immigrants to Canada from the 1950s to 1970s, funded by the Stavros Niarchos Foundation. For a full lineup, visit the website. Those interested in attending can RSVP to events@hhf.ca or by calling (16-447-7107. The conference will take place at York University, Student Centre, Chancellors Room on May 4, beginning at 9 am and ending at 5pm. More details are available on the event website. Find out more about our Hellenic Studies program.